Bernard Lyle "Bernie" Goskie, 91, of Cape Girardeau, formerly of Marble Hill, Mo., died Thursday, March 24, 2011, at the Missouri Veterans Home. 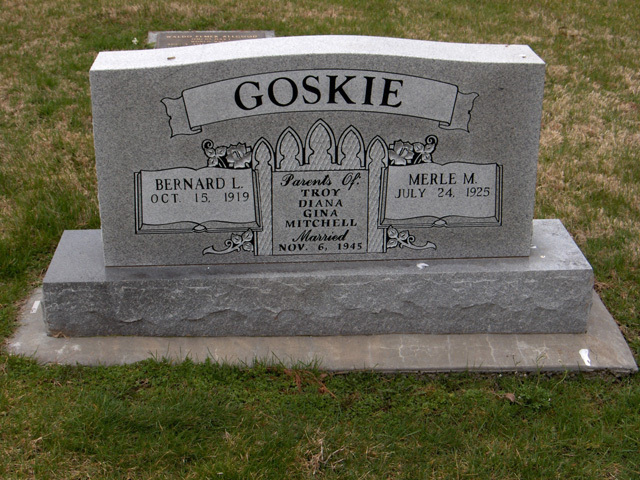 He was born Oct. 15, 1919, in Thebes, Ill., son of John and Ethel Cox Goskie. Survivors include his wife of 65 years, the former Merle Mae Harlan; a sister, Juanita Vail of Grassy, Mo. ; four children, Troy Goskie (Gloria) of Eugene, Ore., Diana Beattie (Don) of Jackson, Gina Sinecki (Scott) and Mitch Goskie (Jeanne) of Nashville, Tenn.; six grandchildren; and 11 great-grandchildren. Goskie served in the U.S. Army during World War II, stationed in several war zones in Europe. He was happy to come home to Missouri when the war was over, marry his sweetheart and raise his family. He was well-known around Marble Hill for his keen mechanical ability, working in the field of auto, truck and bus mechanics most of his adult life. His happiest hours were spent bending over the engine of a car or playing poker with the late Tom Runnels and friends, or driving the country roads in the area. His generous spirit and gentle humor will be missed by all who loved him. The funeral was March 27 at Liley Funeral Home in Marble Hill, with the Rev. Fred Ritter officiating. Interment was in Bollinger County Memorial Park Cemetery with full military honors.